This was advertised as being a canister, but my first impression was that it would make a good holder for straight knitting needles if I removed the wooden lid. I didn't realize just how tall this canister is until I brought it home and put a few of my long straight needles in it, pictured on the right. They are only a couple of inches taller than the container, so my shorter needles would disappear completely from view. No worries, however. I'm now seeing this as a nice decoration all by itself, or as a vase to hold some tall flowers likes irises or sunflowers. Now the best part. It was on sale for $4.94 plus tax. No, I didn't forget a number or move the decimal point to the wrong position - only $4.94!! But wait, there's more. I couldn't resist picking up a package of mugs. These weren't on sale, but still only cost less than $10.00 plus tax for a package of two. 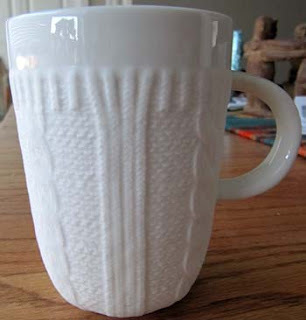 I paid more than that for a single, similar mug, at Starbuck's a couple of years ago. Total bill, including the tax, for the canister and two mugs: $13.57! The name of the pattern is "Cable Knit". Sounds right to me! By the way, there was one other piece there that I didn't check out, perhaps a tea pot. 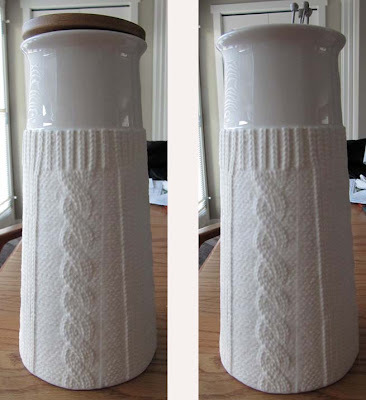 love that canister -- I'd still use it for your long needles since all you need to see is the top -- it's awesome! And wow, what a bargain basement price. You could put your short needles in the mug! Wow - what great deals! The mug is just fantastic.